Heard about the latest sacking incident this morning? Better watch what you say on social media. Do you know you can be terminated for saying the wrong things online? 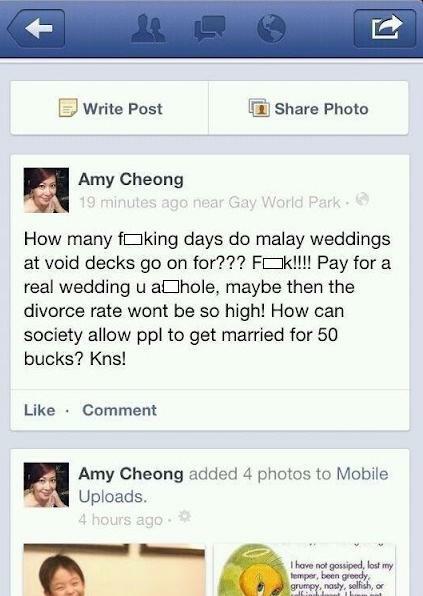 Amy Cheong is being sacked by her employer NTUC for posting a "racist message" on her facebook page. See story in TODAY 8-Oct (as below). "The NTUC takes a serious view on racial harmony in Singapore. We will not accept and have zero tolerance towards any words used or actions taken by our staff that are racially offensive," said Mr Lim Swee Say, Secretary-General of NTUC in a statement. "NTUC has terminated with immediate effect the services of Ms Amy Cheong, Assistant Director, Membership Department after establishing with her that she did post offensive comments on her personal Facebook page on Oct 7. Ms Cheong later posted a comment on her Facebook page - which has since been taken down - apologising for what she described as a "silly comment". "It was my own bad judgment which I truly regret," she wrote. "I was just upset with the noise. I truly do not mean to be judgmental or critical. I am truly sorry." girls looking for men of very same group. ought to i've to attend to be much more more mature to get them or what? the SSRI's definatley can call important excess weight acquire. It is not up for debate!! !